The waiting room in the Civil Affairs office in Changsha is long and rectangular, and the walls are lined with bamboo couches. A few tables are scattered throughout, but mostly it’s pretty open. We were joined soon enough by two other families, one of which already had their baby. 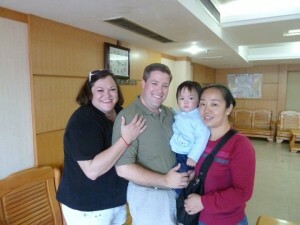 Ashley stepped out to check if the Chenzhou babies had arrived yet (they hadn’t). You know the feeling you get when you’re on a roller coaster and you’re heading to the top of that first gigantic hill? Yeah, that’s about how I was feeling. I now have a deep appreciation for the expression “jumping out of my skin”, because that’s *exactly* what I felt like. We sat in that room for what felt like FOREVER. Every time somebody came close to the door we jumped up. FINALLY we saw a woman enter…with a little baby girl. SO not our kiddo. Right behind her, though, was a diminutive woman in a bright pink sweater, and she was holding the hand of a tiny toddler in a pale blue coat. His hair was too long, and his cheeks were flaming, and, after five years of waiting, *this* was our child. I looked at Kevin, who hadn’t quite recognized him (we were both still floating in a weird state of non-reality), and I said “There he is.” All of a sudden we had no idea what to do. We stood up and walked (flew) the ten or so steps over to little Chen Jian Hua. I knelt down and told him hello in Mandarin. Kevin was armed and ready with the video camera. I reached out to touch my baby, and he shrank back from me into the familiar safety of his nanny’s arms. She whispered to him, telling him who we were, but he wanted absolutely nothing to do with us. I tried to engage him for a couple more minutes, and finally I couldn’t stand it anymore; I reached out and hugged him to me. I told him over and over that I loved him (in Chinese, of course), and he cried his eyes out. Kevin tried to distract him with the toy truck, and that actually worked for about five seconds. During all of this, the nanny was showing us what she had brought for him: a few toys, his vaccination records, a chop (a personalized stamp), and the clothes in which he was found. I was trying my best to answer the questions Ashley was asking as we were trying to clarify names and addresses for paperwork, all the while wrestling a terrified toddler. After a few minutes of holding him and rocking him, I handed him over to Kevin. As long as I live I will never forget the look on my husband’s face as he held his son for the first time. Tears were streaming down both of our faces, and I can honestly say that I’ve never seen Kevin so incredibly happy. He somehow managed to calm the baby down, and we were able to sit for a couple of minutes and wrap up the rest of the paperwork that needed to be done that day. We had prepared a list of questions to ask his nanny, and I have to give Kevin some major props for remembering to refer to the list. It was all pretty basic stuff: Nap times, questions about poop (little did we know just how much our lives would come to revolve around poop), likes and dislikes. 45 minutes after setting foot into the waiting room, we were on our way back down to the car. Instant family. Just like that. Ashley had a stop to make on the way back to the hotel, so the three of us were able to spend some quiet time in the car playing “Getting To Know You”. Little Man had a fever (he had a raging upper respiratory infection), but he was surprisingly calm by this point. He was looking out the window with naked curiosity, and he was very interested in both Kevin and the toy truck. Ashley was back soon, and he told us he was taking us back to the hotel for a couple of minutes and then to lunch. 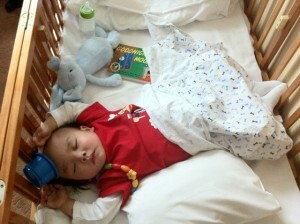 Once back in the hotel, we quickly changed the baby’s clothes. It was HOT outside (side note: In China, they run the air conditioning according to season, not thermostat, so even though it was 80 degrees, we had no A/C in the hotel. Yikes. ), and he was wrapped up like the kid in “A Christmas Story”. Trying to be mindful of the fact that the Chinese think it’s unhealthy to have babies dressed in anything other than 95 layers of clothes, we kept him in a long-sleeved onsie. We layered on a t-shirt and some long shorts (on him, they looked like pants), and we headed back down to the lobby. Sure enough, Ashley warned us that we had not dressed the kiddo warmly enough. As IF. We also knew it wouldn’t be the last time somebody told us that, so we weren’t too concerned. We walked the 1/2 block to the restaurant, and Ashley ordered for us, keeping the baby’s G6PD in mind. He told us that he had ordered traditional Hunan dishes, including pork with green peppers, steamed egg and congee for the baby, and a beef and mushrooms dish. I am not a fan of the green pepper, but I wasn’t really paying much attention; I was more concerned with feeding the hungry little bird who was seated to my left; we had been worried that he wouldn’t want to eat, as is sometimes the case when babies are first placed. It turns out that the pork was AWESOME; so good that I’m making it tonight for Lunar New Year! It also turned out that I shouldn’t have worried about his appetite. He hoovered down everything we fed him. After lunch we headed back to the hotel, and we spent the remainder of the afternoon basically sitting around staring at this little boy who was now ours. We settled him in for an afternoon nap, and he was out in seconds. I’m sure he was exhausted from the morning. There are no words to adequately describe just how odd it is to go from two people “approved and waiting” to being parents in a matter of seconds. We were literally handed a child who was now ours. We didn’t know him; aside from the snippets of information we got from his caregiver, we had NO IDEA who this little creature was. I didn’t know what scared him, what made him giggle, where he was ticklish, IF he was ticklish….NOTHING. I have never been so intimidated in my entire life. Our kiddo was a whole little person who had already formed his own identity without any help from us. I’d had 5 years to prepare myself to be a mom. I’d read countless books, not just on parenting, but parenting an adopted toddler. I could tell you all about attachment theory and sensory processing disorders, but it all flew out the window once I held 24 pounds of squirming boy. I found out just how woefully unprepared I was for this moment; then again, nobody could EVER be prepared for something like this. I have never been, nor will I ever be, more profoundly grateful than I was that day. I was grateful, yes, for my precious boy, and for the opportunity to be his mom and make him happy, but I was even more grateful to have made this journey with my husband. Kevin held my hand during the endless wait; he propped me up when I sagged under the weight of it. He listened while I worried endlessly about who our child would be and whether he or she would be the right fit for our family. That afternoon, as we sat in the stuffy hotel room watching our sleeping son, I knew that there was no better father on Earth than my husband, and I knew that we’d figure out this whole parenting thing together; soon enough we’d be obsessing about poop like old pros (also? You totally know you’ve gotten the hang of the “parent” thing when poop doesn’t gross you out anymore). The best moment of that day, though? Holding my baby, I looked at Kevin with tears in my eyes, and I told him that I couldn’t quite wrap my brain around the fact that I wasn’t just babysitting someone else’s child. I didn’t have to give him back. It was the most exhilarating and terrifying feeling ever. We had a pretty early wake-up call on Sunday morning. In order to fight our way out of Beijing traffic to the airport, we had to leave the hotel at 6:15. Jerry once again met us in the lobby and made sure we got checked out OK. Mr. Crankypants met us with his usual scowl, and we jumped into the car and headed to the airport in the just-breaking dawn. Now, I’m not a morning person (I know, shocking, right?). so it took me about 20 minutes or so to tune in to the conversation that Jerry was having with Kevin (also? I’m so glad the ride to the airport took almost an hour so I got to hear all the good stuff). Jerry began telling us about the Chinese saying “You are thousands of miles apart but you come together because you have yuan between you. You face each other but you don’t know each other because you don’t have YUAN between you.” We knew a bit about this; after all, we had been sporting our red thread bracelets for quite a while (the Chinese adoption community is big on the “Red Thread” proverb, which is basically what Jerry was telling us about). What we didn’t know, however, is just how deeply the concept of “yuan” is embedded in Chinese culture. If you have yuan, you become a family, friends, classmates, colleagues, and neighbors. Some Chinese like to say that a relationship has to be cultivated for at least 500 years before it blossoms. This saying shows their appreciation for the relationship because it is not easy to wait for 500 years. What Jerry told us is that we are connected to him through our yuan. He believes we were destined to meet, and because of that, we’re connected for life. When I said before that we consider him part of our family, I absolutely meant it, and we have become his family, too. I will never cease to be amazed at how quickly complete strangers can come together and form lifelong relationships. I absolutely buy into the concept of yuan. By this time, we were pulling into the airport. We got out, Mr. Crankypants unloaded our luggage (and what’s that??? A SMILE??? AND a HANDSHAKE??? Hmmm. Maybe not so cranky after all…. ), and Jerry escorted us into the insanely busy Beijing airport. After some impressive haggling with the airline agent to reduce our baggage fee (we were over the allowed weight since we were traveling with three bags, and there were only two of us), we headed to Customs (in China you get it coming and going). We said goodbye to Jerry, and we promised to call him when we got back to town in a couple of weeks; sadly, he wouldn’t be our guide on our return trip as he was already booked with another group. We promised to meet up with him when we could, though. I was surprisingly sad to say goodbye to him, and I’m sure it had to do with the fact that we were now on our own. 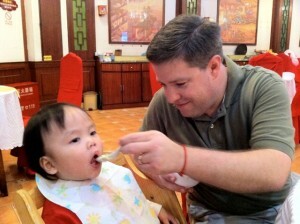 I’ve been to plenty of foreign places, but nothing even comes close to being a westerner in China. I absolutely love the country and its people, but it’s a bit overwhelming in the beginning. Plus, it was very sad to say goodbye to our friend, even for a little while. We made our way to the HUGE security line (have I mentioned that there are 19 million people in Beijing???) and eventually we were called up to the officer. After thoroughly examining our documents, we were waved on to the metal detectors and pat-down people. Let me tell you this, too: I never minded AT ALL being frisked at airport security while in China. They were efficient and respectful, and if the TSA could manage to pull that off we’d be way better for it. And that’s all I have to say about that. Once through, we found our way to our gate. It quickly became apparent that we would have to be bussed to the aircraft. If you’ve ever flown out of Miami to the Bahamas or the Caribbean, then you have some idea of what I’m talking about, except it’s WAY more confusing. They don’t call you by group number or anything else, and because it’s the culture, there’s a whole lot of pushing and shoving, both to board the bus AND to board the plane. Once we were finally aboard, we realized we were definitely the only gringos. The other thing we noticed was that China Southern airlines is NICE. Really, really, really nice. We settled in, and in no time we were backing up and hitting the taxi way. They don’t so much enforce the whole “stay seated with your seatbelt securely fastened” rule aboard China Southern, as there were people milling around the aisles up until about 10 seconds before takeoff, and again as soon as we were airborne. It was really fun to watch the little old men who had obviously never flown before as the peeked out the windows, and as we flew over the Yangtze River (which makes the Mississippi River look like a puddle, incidentally), almost the entire plane got up and crossed over the aisle to see out the other side. People were piled on top of each other just so they could catch a glimpse of the HUGE river below. Thankfully, it was time for meal service, so everybody settled back down. Oh, and you heard right: MEAL SERVICE. On a two hour flight. In coach. Also? It was really tasty. Take that, American Airlines. There was one other thing that was a bit different about our flight: About 20 minutes before landing, a the video screens dropped and a calisthenics program began. All of a sudden the entire plane full of people started doing chair aerobics. The subtitles were *awesome*, too. Apparently, one’s chi can become unbalanced during air travel, and the lovely ladies of China Southern were there to help restore it. I was torn between REALLY wanting to shoot video and stretching along with everybody. I chose stretching, and you know what? I felt spectacular afterward. They’re definitely on to something. We landed in Changsha not long after lunch was served, and it was time for my very first experience with the squatty potty. While Kevin waited for our luggage, I scouted out the bathrooms. I really don’t know what I was so nervous about, with the possible exception of the small chance I would lose my balance, because it was absolutely no big deal. I will say that I’m glad I was prepared for it, but it was a piece of cake. By the time I was done, Kevin had our bags and we made our way toward the exit (you have to have your bag claim tickets verified by an agent before you can leave the airport with any claimed luggage). Waiting just on the other side was Ashley, who would be our guide for this leg of our journey. The first thing we noticed is that Ashley looks almost *exactly* like someone we know (and no, I’m not going to say who). He didn’t have a sign with our names on it, but we KNEW he was our guide, and we gravitated straight to him. Sure enough, we were right. He got us out to a van, loaded our bags, and we started the drive into Changsha. On the way, Kevin was checking his iPad for our hotel confirmation, and Ashley was immediately smitten. He asked if he could play with it, and of course Kevin let him. Kevin was also cracking (lame) jokes the whole time, and he really tickled Ashley when he said that the national bird of China must be the crane (we were passing through a particularly developing part of the city, and the skyline was filled with construction cranes). It took Ashely a full minute, but he finally got the joke and let out a huge laugh. He told us that the American sense of humor is wonderful, and that he tries so hard to joke like that, too. By the time we got to the hotel, we knew we had stuck gold with our guide yet again; sure enough, by the end of our time in Changsha, Ashely would become part of our family, just as Jerry had. We pulled up to the Dolton, Ashley got us all squared away with the front desk, and he went with us to our room to make sure we had everything we needed. He stuck around long enough to explain what we could expect the next day; there was a lot to go over so we would know what to expect when we got to the Civil Affairs office. He told us what paperwork we needed to bring (mostly just our passports and one or two other forms), and how the morning would go. Then he said he’d see us the next morning around 10:00 and he left. Oh, great. Now we had the whole afternoon to get ourselves all worked up. We set out to explore the hotel and decide on which of its restaurants we were going to try for dinner, and I had my first experience with the Chinese escalator. The Dolton is a pretty big hotel, and there are quite a few shops and restaurants spread out over a couple of floors. We hopped on the deceptively slow-moving escalator to head up, and as soon as we did, that thing took *off*. It was CRAZY fast. As soon as we stepped off, it slowed back down. It turns out that this is an energy-saving measure, and it’s pretty frickin’ cool. I felt like a little kid; I just wanted to ride that escalator all day. We had to decide on dinner, though, so we started checking out the menus of the various restaurants. Nothing on the Chinese menu seemed very appealing to me that night, so we headed back downstairs to the western-style dinner buffet. After cruising through the room and seeing the various options, I chose to order off the menu. I wasn’t quite in the mood for anything as exotic as I was seeing (this turned out to be a mistake. Just like ordering Chinese food in America is not the real deal, neither is ordering western-style food in China. I learned my lesson once and for all in Changsha). As soon as we ordered, though, I began to feel absolutely awful. Our drinks hadn’t even made it to the table, but I didn’t think there was anyway I could wait around for them. Kevin, being the amazing man that he is, sent me back up to the room and promised to sort everything out. He made it up to the room about 10 minutes after I did, and he had a waiter in tow. Kevin had somehow figured out how to communicate the fact that we wanted our dinner wrapped up and taken to our room, and Jason (his Americanized name, obviously) had complied. Kevin gave him a hefty tip, which is frowned upon in China, but he had gone so far out of his way to help us that Kev felt compelled. Jason thanked us in broken English, shook his hand, told me to feel better, and then I tried to eat dinner. Before anybody jumps to the (incorrect) assumption that food or water was the root of my illness, let me just say that I think that stress and exhaustion had finally caught up with me. After I ate a few bites of food, I took a Benadryl and fell into drug-induced slumber, which was exactly what I needed. We woke up super early the next morning and hit up the breakfast buffet. Then we wore holes in the hotel room floor with our pacing. We checked and rechecked the baby essentials we had packed in my backpack. We double and triple checked our paperwork and our passports. We made sure Kevin had a toy truck tucked in his pocket. FINALLY it was time to meet Ashley downstairs in the lobby. I was super happy to see that Dean the Doorman was manning the front doors of the hotel; he’s sort of a legend for parents who’ve adopted from Hunan province. He has a ridiculously huge smile, he’s very tall, and his mannerisms are beyond exaggerated. He also has a special affinity for babies and the couples who adopt them. You can’t help but smile when you see Dean. I took this as a good sign of how the day would go. The next time I post, it will be the story of the moment we became a family (my best friend’s son calls their family of three a Three Family, and that’s how I think of us, now too). Up until now, I haven’t talked a whole lot about what we were actually feeling, and truth be told, from the minute we touched down in Beijing until the moment we got in the car that day, we hadn’t had a whole lot of time to feel anything; we’d been too busy or too tired. Now, though, it all came crashing over me in a huge wave. If you’ve seen the documentary “Wo Ai Ni, Mommy”, then you probably remember the moment when Donna Sadowsky was about to leave her hotel room. She took a huge breath and teared up. That’s exactly how I felt, and exactly what I did. The morning had seemed surreal, and I remember trying to take in every single moment of the drive over to Civil Affairs. I remember being fascinated by the fruit stands and the dumpling vendors, and then….nothing. Everything was kind of a gray blur for the next ten minutes. The only thing I can recall is that I had to pee. BAD. For someone who prides herself on an ironclad memory, I honestly cannot tell you what thoughts were swirling around in my head. We made it to the Civil Affairs building, and Ashley let us out while he found a parking place. Kevin and I just stood there completely paralyzed. I had seen pictures and video of this building, and I knew exactly where we were going, so by the time Ashley came back, I was chomping at the bit to hit the button for the third floor on the elevator. Then the doors opened, we stepped out, and there was….nobody. Seriously. Nobody was there. The place was empty. And I still had to pee.